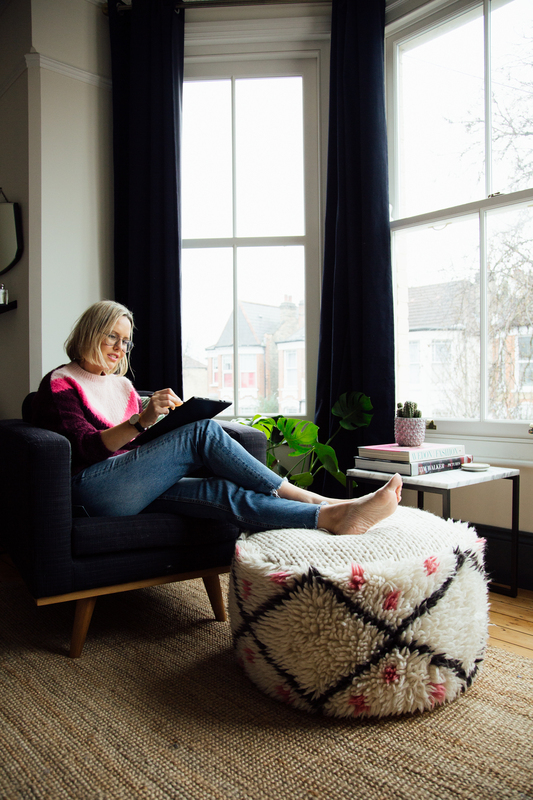 Using: Surface Pro 6 at my office in North London. 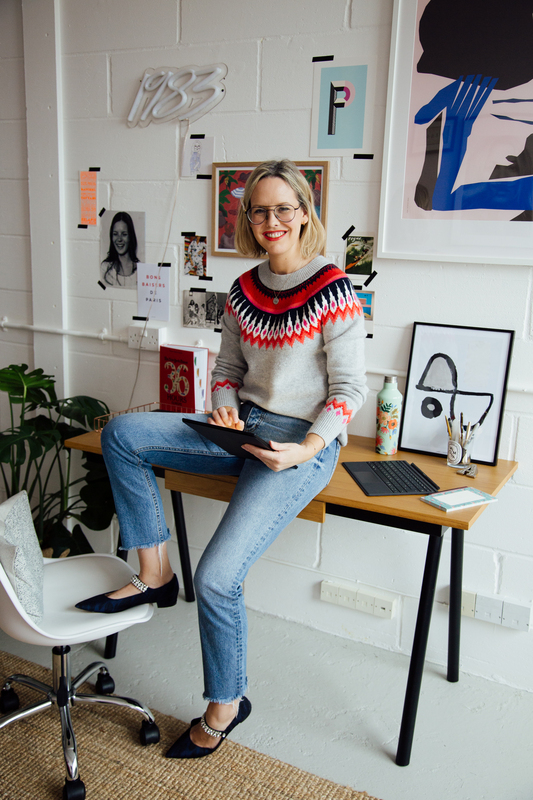 Wearing: Jumper: Boden (out of stock but blue and yellow available here). Jeans: H&M (old). Shoes: Kurt Geiger (old). Photographs: Eva K Salvi. This is not something I set out to achieve when I began, blogging wasn’t ever a commercial venture back then and it wasn’t on my agenda but over the years my website has grown organically and now we have 4 members of staff, as well as contributors and I am so excited for what’s to come. I use a Surface Arc Mouse for my Surface Pro 6 to have all the feels of working on a desktop, but with the freedom of a laptop, this also has a touch screen for ease. 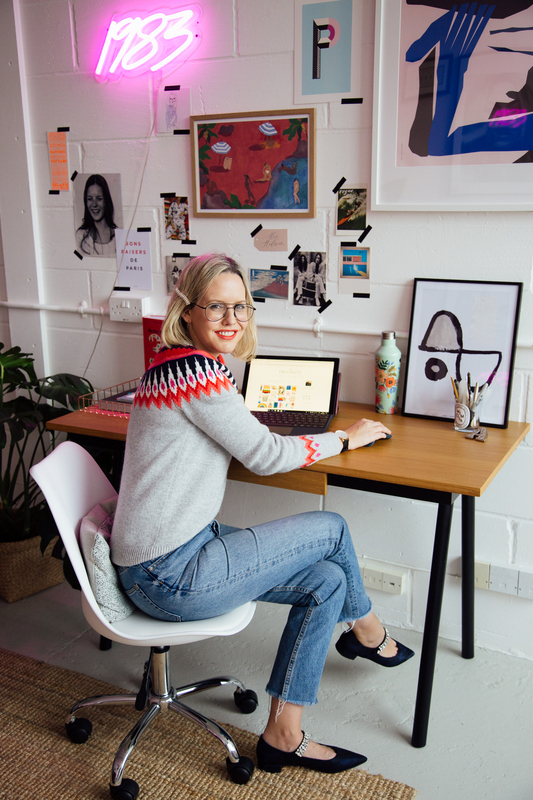 Starting a business isn’t something I knew anything about, coming from a creative background. I have never written a ‘Business Plan’, I have never applied for a business loan, instead I built up what is now a profile which reaches millions of people every week with a laptop and the internet. I had no training online (despite a brief stint running Diane Von Furstenberg’s UK website in 2006, but I’m sure I did more damage than good! ), and would play around online on my sofa as I didn’t even have a desk in our flat. My first blogspot domain was free, and I took the photo for the header myself, I set up a Twitter account and started sharing my posts. One thing I learnt quickly was: if you don’t share your work, no one will ‘find’ it. My schedules were all planned and listed in Microsoft Word, and still are. It’s essentially my Bible of ideas as well as date planning – I started posting every other day but posts were simpler like recipes, tips for researching holidays online (delete your cookies as the flight retailers know you’re coming back to buy and the prices go up!) and my top High Street buys. Photos were shot in the alleyway of our flat and on the weekends (usually Sunday night) I would upload and schedule posts for the week, as I still worked full-time at my incredibly full-on magazine job. I was lucky; PRs got on board with my blog relatively early on as I already had a credible name in the industry but it wasn’t until around 2014/15 that the blog really came into its own. 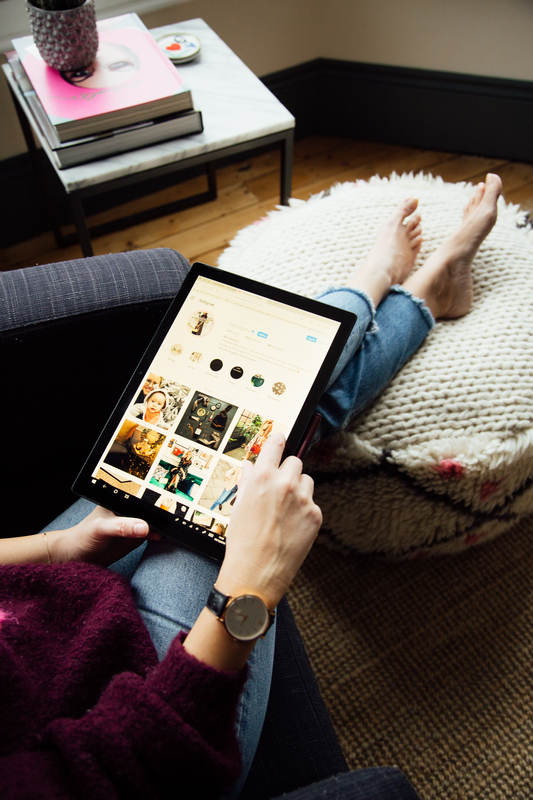 Instagram had arrived and my readership was growing, gaining around 250k Pageviews a month and I decided to leave my job. 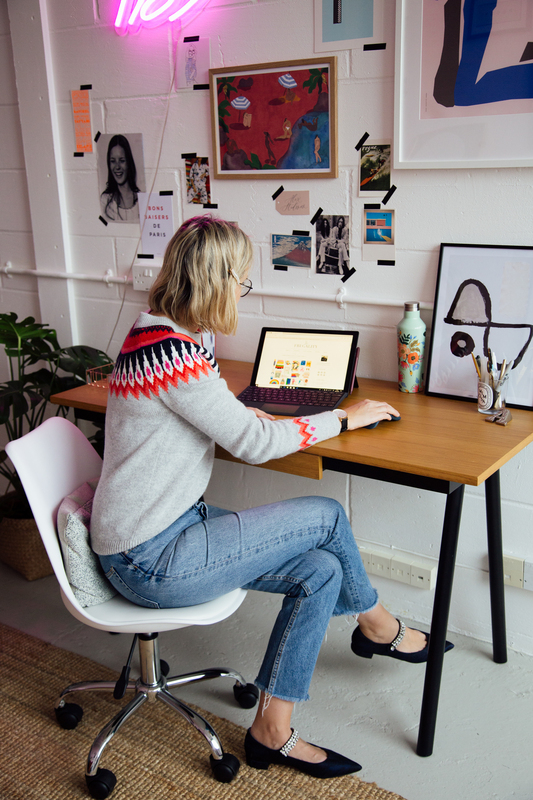 I left my full-time job to work as a freelance stylist, the blog still could not pay my bills alone but I realised I had a voice in this internet driven-world and I wanted to see where it could go. I have always been very careful with money, hence my blog’s name! And this ethos has been put towards my business, too. Over the last year I have grown slowly, paid projects and partnerships have allowed me to gradually employ an assistant, and more recently rent an office space and an office manager. All of these things support me as my website grows and reaches more people. 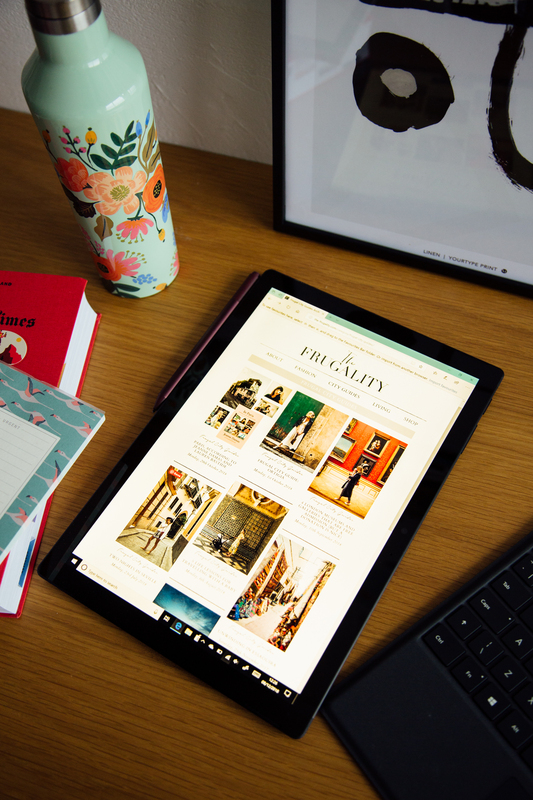 For me, my blog serves as a website and a resource for people, it’s not an ego project and any money I make on my site goes back into the business – it goes towards staff, web designers, researching Frugal City Guides, camera equipment, photographers etc – the list is quite long! And one thing I wasn’t ready for was the business admin side of my new role. 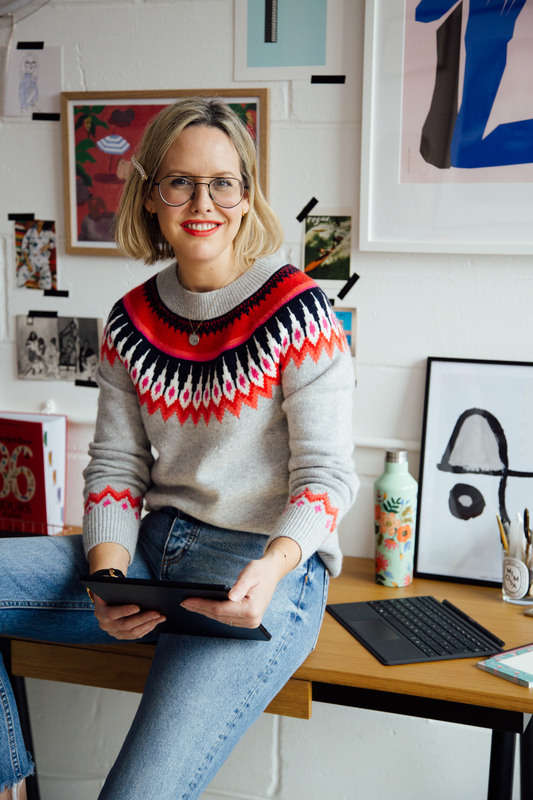 Being a Fashion Editor by trade, I was never really part of the invoicing/advertising/legal/contracts/logistics side of things, so it has been a real learning curve for me (and something Office 365 mainly helps me with!). 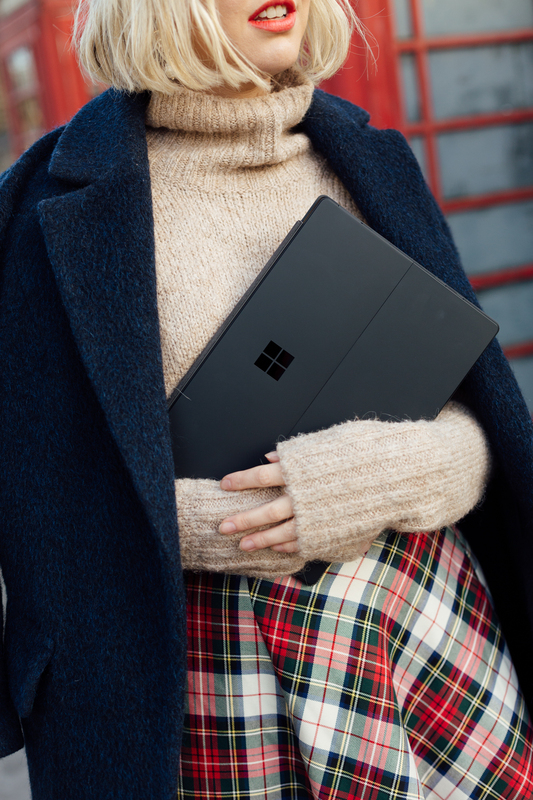 Using: Surface Pro 6. Wearing: Coat: Whistles (old). Jumper: H&M (old). Skirt: H&M. Bag: Sezane. What I love most is the freedom to do my job from anywhere, I have a super lightweight Surface Pro 6 for on the go which fits in my bag easily so I can be ready to type copy or check my emails between meetings in town, and it can also be used as a tablet when at home but still with a high-power performance (I can often be found browsing and checking my site’s functionality at home on the sofa). Also handy for Skyping my best friend in America or watching Netflix when Chris wants to watch football on TV. A lot of my team work remotely, too, so the software I use has to work within these parameters. I use the Surface Pen on OneNote to write notes on the go (particularly great for highlighting issues to the web designer, as it’s much easier to ‘ink’ on a screen than describe visuals via email), we use Office 365 for all shared documents in the Cloud so everyone knows what is going on at all times (despite spending most of my school life hating spreadsheets, I have since become quite a pro on Excel and, in fact, couldn’t live without it now). I spend a lot of my days in meetings and seeing new products and working on content ideas, so the ability to check in with Kate at my office or edit video changes with Chris remotely, is crucial. 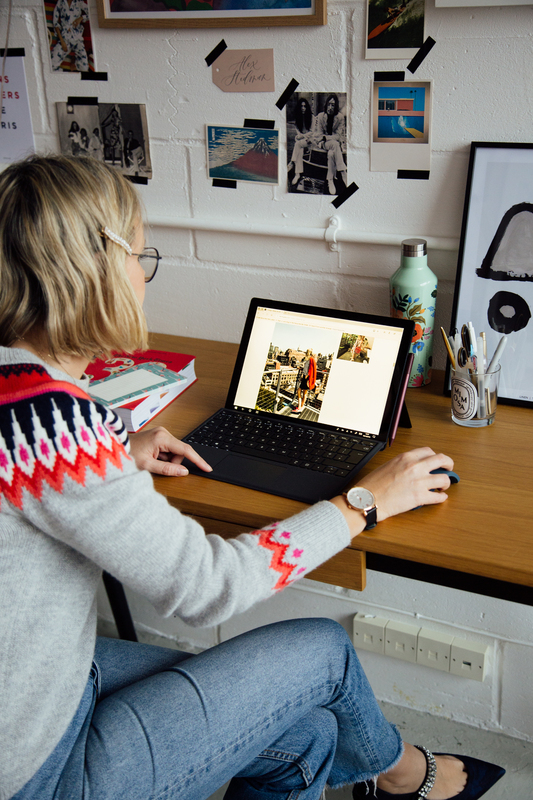 The Surface Pro 6 is great for editing photos, too, which means I can use my editing software and upload from pretty much anywhere. 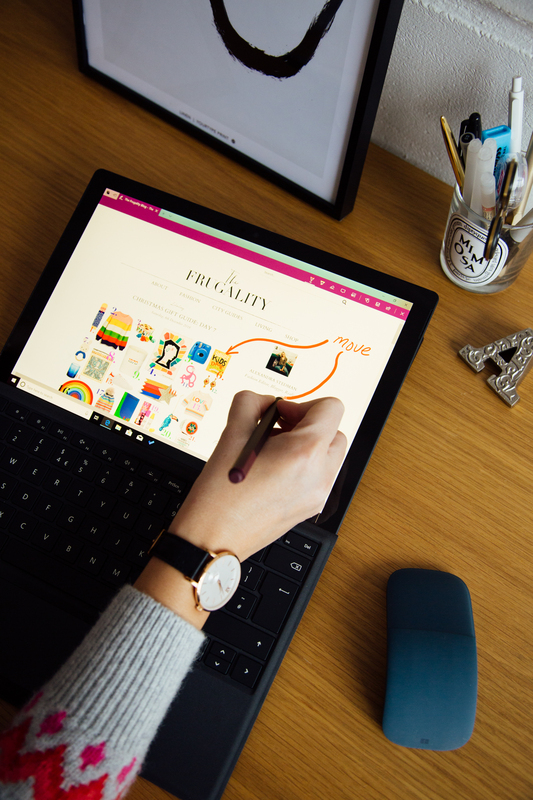 Using the Surface Pen on OneNote. 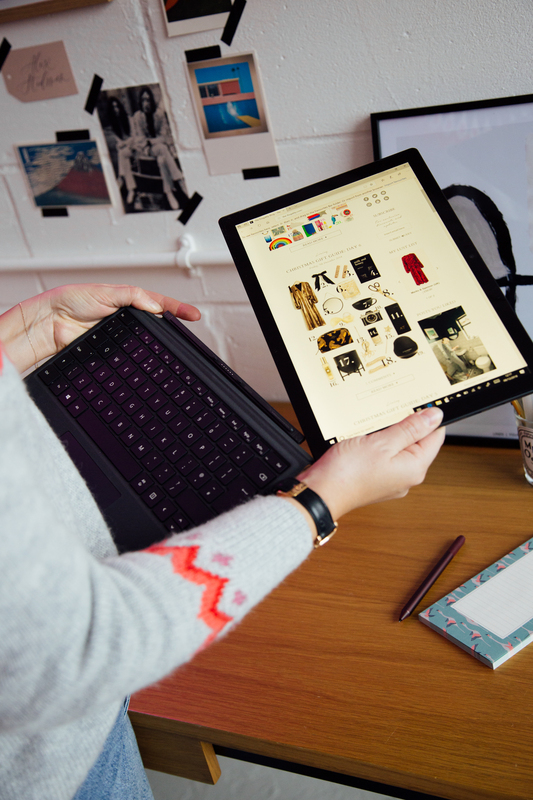 The Surface Pro 6 can be used in both laptop and tablet format. I suppose the hardest part of my job is splitting my time between work and home and having that ‘work/life balance’ which I honestly haven’t figured out yet. But I am taking a few steps in the right direction: renting an office space, hiring an office manager, investing in the right equipment (whether it be a camera that shoots square for Instagram or a laptop which can also be used as a tablet at home so I can associate home with ‘downtime’). It all goes towards helping when life gets that little bit too busy. 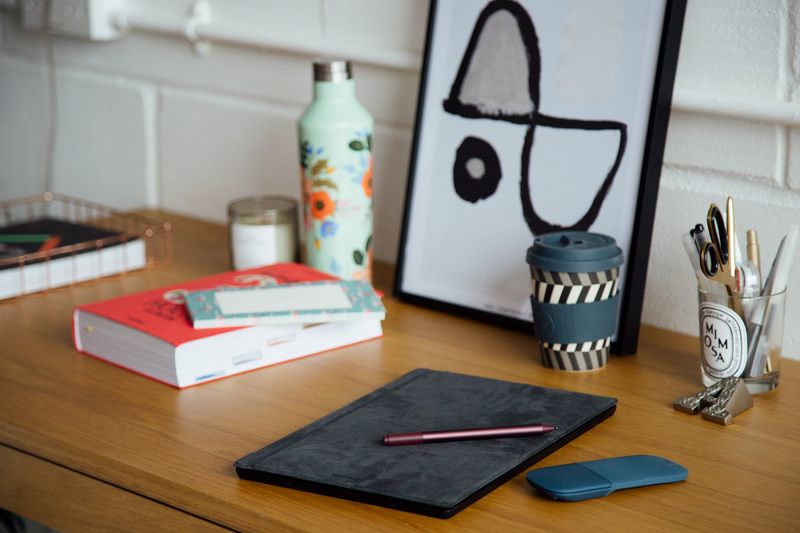 A lot has changed since I started tapping away from my flat, but I can now say that I have set up a Business from scratch, that allows me to employ people, work around my family, and support my daughter. But one thing that has stayed the same throughout this time, Chris’s support since day 1. He took that first photo of me in the alleyway by our flat and helps in the daily running of The-Frugality, without whom, there wouldn’t be a blog to read today. 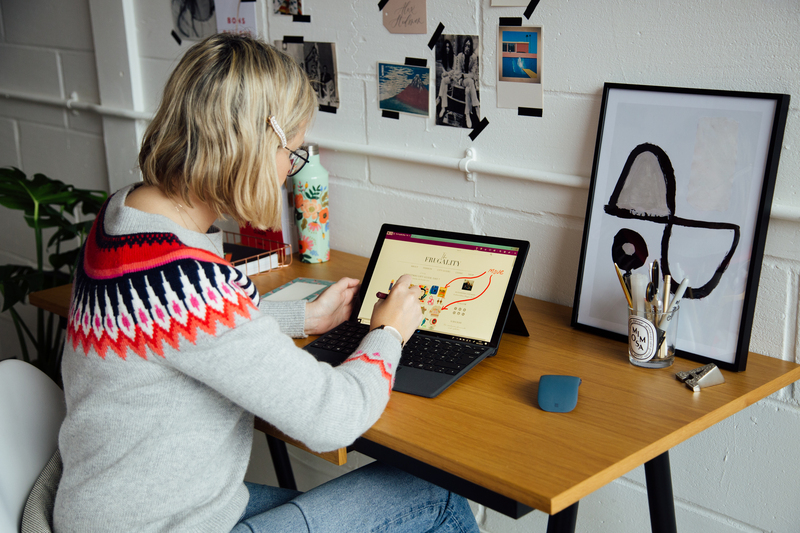 This post is in partnership with Microsoft Surface, a brand which is changing the way I work, plus the Surface range in the new matte black colourway looks pretty good, too, no? Congratulations. You are an inspiration. Especially to a amateur like me.